The Masters Tournament in Augusta was different this year. As always, it was exciting and beautiful, but -- for the first time in almost half a century -- I couldn't hope or fantasize that maybe -- just maybe -- either Arnold Palmer or Jack Nicklaus would suddenly, unexpectedly, catch fire and emerge as the winner. 2006 was the first Masters since the 1950s when neither Nicklaus nor Palmer was playing in Augusta. 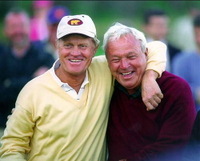 Even as Palmer and Nicklaus moved past the age of 60, I always felt -- every year -- that, somehow, one of them would manage to put it all together one more time, and become the surprise winner. But Arnold retired from the Masters Tournament after 2004, and Jack called it quits after 2005. I'm happy for this year's winner, Phil Mickelson.... he's a remarkable golfer, and seems to be a good person..... but I must confess I was hoping Freddie Couples -- who's 46 -- could hold on and become the oldest winner ever at Augusta. Oh well, you never know.... there's always Gary Player. He's 70, and still at it -- and I'm sure he could use one more green jacket.